134 Wooster Street in Manhattan. Image Credit: Morris Adjmi Architects. Morris Adjmi-designed plan would be faced with steel frame inspired by cast-iron architecture in front of a setback glass curtain wall. On March 15, 2016, the Landmarks Preservation Commission considered and approved a proposal to demolish an existing 1940 garage and construct a new retail and office building at 134 Wooster Street in the SoHo-Cast Iron Historic District. Premier Equities are the site’s developers. The development shares the same block as another planned development previously approved by Landmarks and the City Council, at 150 Wooster Street. The building’s ground floor will be retail space, with office use in the upper stories. The use will be as-of-right under the lot’s M1-5A zoning. Li Saltzman Architects’ Preservationist Meisha Hunter Burkett stated that that the lot had at one point been occupied by a three-story building, which was demolished in the 1940s and replaced with a garage. The garage building is currently home to an Adidas store. The rest of the block was dominated by five- and six-story masonry buildings, with buildings primarily in the six- to eight-story range facing the block across the street. Hunter Burkett pointed out that the garage proposed for demolition was not identified as being of any style in the district’s designation report. Architect Morris Adjmi, of Morris Adjmi Architects, presented the proposal for the seven-story building, with six stories at the street wall and seventh setback penthouse floor. The facade would be composed of a steel frame in front of a glass curtain wall, with the frame echoing the windows and organization of cast iron architecture. The frame would be arranged with a clear base, middle, and top, with number of arched window bays increasing up the facade toward the cornice. The four-bay sixteen-foot-tall base would also have a granite strip where it meets the sidewalk, and also “feet” on its columns, to ground the building. Behind the frame, the curtain wall would also step back as the building rose, so that facade would have differing depths. The glass would be six inches behind the frame at the base, and one-and-half feet behind the front of the facade at the base, and three and feet ten inches of total depth from the front of the frame at the sixth floor. In addition to the penthouse, bulkheads and water tower would also be located on the roof. The proposed buildings’ sidewalls and penthouse would be partially visible from some street vantage points. 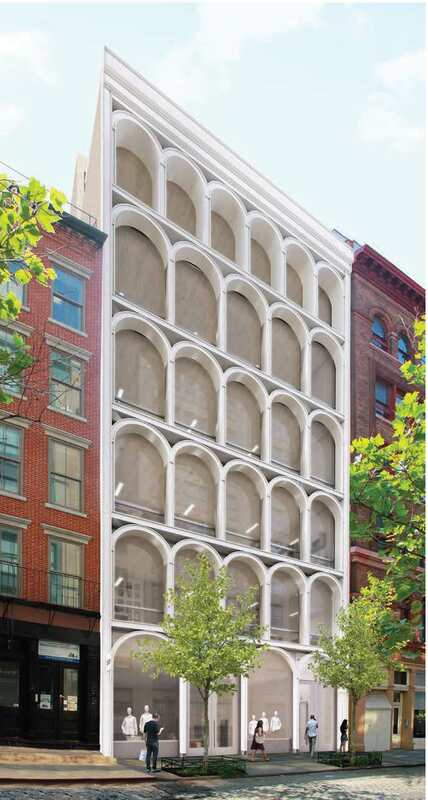 The Historic Districts Council’s Barbara Zay argued that the building’s design “channels Modern architecture, like that of Lincoln Center, more than the cast-iron vocabulary of SoHo,” and that the proposed off-white color scheme would starkly contrast with its neighbors. Landmark Chair Meenakshi Srinivasan stated that Manhattan Community Board 2 has issued a resolution approving of the proposed demolition, but calling for the proposed base to be altered, and for the base’s cornice to align with that of the adjoining building. Adjmi responded that the proposal presented to Landmarks reflected alterations made after meeting with the Community Board. Chair Srinivasan applauded the proposal as contemporary, elegant, and respectful of the district, but asked the applicants to work with staff on lowering the height of the penthouse. Srinivasan then led a unanimous vote for approval. LPC: 134 Wooster Street, Manhattan (18-1954) (March 15, 2016) (Architects: Morris Adjmi Architects).